Metamorphosis, now playing at the Royal Alexandra Theatre, is one of those rare theatre pieces where the creators have given equal weight to all elements of the production – set, costumes, lighting, music acting and movement – in telling their story. The story here is Franz Kafka’s Die Verwandlung (1915), one of the most important works of fiction in of the 20th century. It is the story of an extraordinary transformation and the production, a co-production of Lyric Hammersmith from England and Vesturport from Iceland, is just as extraordinary as the story. One morning the travelling salesman Gregor Samsa (Björn Thors) wakes up to find that he has been transformed into a giant insect-like creature. Kafka, a forerunner of absurdism, gives no explanation why the transformation has occurred. Instead, he focusses on how Gregor and his family deal with his condition. While Gregor’s sister Greta (Unnur Ösp Stefánsdóttir) and his parents Lucy (Edda Arnljótsdóttir) and Hermann (Tom Mannion) are at first horrified, Lucy gradually tries to be kind to Gregor even though she can no longer understand the bizarre noise that his speech has become. Although Hermann states that Gregor is no longer his son, Greta gradually gets Lucy to feel some compassion for Gregor. The family had previously lived off Gregor’s income. Now they find themselves in the unpleasant situation of having to work. When Gregor drives out a potential lodger (Víkingur Kristajánsson) whose rent would help the family’s finances and who could be a potential husband for Greta, the entire family turns against Gregor. What precisely Gregor has changed into is a mystery. Some translations simply call the creature an “insect”, others are so specific as to say “cockroach”. The word Kafka uses is “Ungeziefer” which originally meant “unclean animal” and now means a parasitic organism. This vagueness is, in fact, a key to the story’s meaning. Whatever Gregor has become is whatever his society, as represented in the microcosm of the family, regards as “unclean” – whether it be his race, sexuality or religious or political views. Kafka (1883-1924), as a German-speaking Jew living in Christian, Czech-speaking Prague was a minority within a minority and had a first-hand knowledge of prejudice. To portray Gregor’s sudden otherness, creators David Farr and Gísli Örn Garðarsson have chosen an actor who also has gymnastic and circus skills. To depict the skewed world that Gregor finds himself in, designer Börkur Jónsson has created a two-storey set – the first floor showing the Samsas’ drab bourgeois living- and dining-room, the second floor showing Gregor’s room. The disorienting part is that Gregor’s room has been rotated 90º away from us so that the floor of his room has become the back wall of the second storey and all the furniture – bed, chair, floor lamp, potted plant, rug – are attached to it. As Gregor, Björn Thors, no wires attached, has to use sheer strength and gymnastic ability to move on his “floor” as if it were not tilted upwards. His physical mastery of this is simply amazing. As Gregor becomes more buglike over time, Thors’s posture becomes less upright and more crouched and he begins to fling himself from object to object as if he had the sticky feet of a fly. The lamp-pole becomes a high-bar and the tears in the wallpaper become hand- and footholds as if for rock-climbing. Thors comes down the staircase by scuttling down the banisters. The ingenious set has even more secrets hidden in which I will refrain from revealing. Thors’s performance is remarkable enough on a physical level but he is also a fine actor and uses words as much as acrobatics to make us sympathize with Gregor’s horrifying situation. The way he controls his voice is masterly – first showing us that Gregor has no clue of the change that has happened, then gradually growing in distress until it subsides in hopelessness as everyone abandons him. The rest of the cast act in a stylized manner derived from expressionist theatre but with which we in North America are generally unfamiliar. They walk in straight lines and turn only at 90º angles and their facial expressions and gestures change abruptly rather than gradually. Since this is hardly a naturalistic story the non-naturalistic acting style is completely appropriate. The fact that four of the five actors are Icelandic and speak in a slightly accented English only adds to the picture the play presents of an alternate reality. Arnljótsdóttir, Mannion and Stefánsdóttir begin the play with a parody of orderliness in the hilarious military-style precision they use in having their breakfast. The order is emphasized only to contrast with the incomprehensible disorder they will face when they see what has happened to Gregor. Physically, the three work as a team with matching gestures and posture. Once exposed to the catastrophe upstairs, they begin to change. Mannion’s Hermann becomes even stiffer, Arnljótsdóttir’s Lucy becomes excitable and weak while Stefánsdóttir’s Greta begins to adopt a more naturalistic style of acting and movement. As Herr Fischer, the family’s potential lodger, Víkingur Kristajánsson acts with pompous self-assurance and “manliness” that sets him up as the exact opposite of Gregor. When Gregor bursts in on the family’s meeting with Herr Fischer and drives him away, Stefánsdóttir reverts to the stylized acting of Arnljótsdóttir and Mannion as the family gang up to exterminate the “vermin” that Gregor has become to them. Key to reinforcing the tragicomic horror of the story is the eerie soundtrack by Nick Cave and Warren Ellis that underscores the entire play and the complex lighting effects of Björn Helgason. This is a brilliantly conceived and executed adaptation of Kafka’s great work that does not rely on high tech machinery as do so many stage shows by Robert Lepage, but on the sheer ingenuity of stagecraft and, with Björn Thors, the amazing ability to combine acrobatics with acting as an indissoluble means of creating a character. With its grotesque humour and its presentation of a parable that is still all too relevant, it is no wonder that this production of Metamorphosis has become a worldwide success since it premiere in 2006. We have to be grateful that Mirvish Productions has been able to bring it to Toronto. 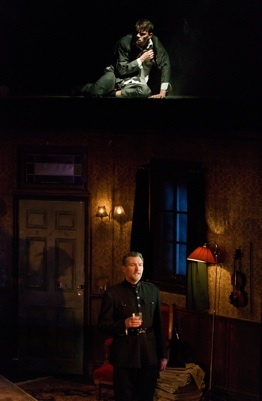 Photo: (from top) Unnur Ösp Stefánsdóttir and Björn Thors; Björn Thors (above) and Tom Mannion (below). ©2013 Simon Kane.